With increasing demand for sustainable, green architecture, architects around the world are slowly embracing eco-friendly adaptive reuse practices. Previously, we talked about Christoph Kaiser, an Arizona-based architect who has transfigured a 1950s grain silo into a modern home for two. This time around, Chris Collaris has embarked on such a mission, as part of the Black Gold project, which aims at renovating an abandoned mega oil-tanker, in the Gulf region, into a dynamic mixed-use structure. Developed in collaboration with Sander Bakker, Ruben Esser and THEY-founder Patrick van der Gronde, the plan foresees the decline of crude oil dependency in the not-so-distant future. Recent economic boom has led to the development of a plethora of high-rise buildings, luxury hotel chains, shopping malls, state-of-the-art airports, science and technology centers, museums and universities in the Arab countries. According to the Netherlands-based designers, rapid urbanization and westernization has give birth to pretentious, imitative architecture. By contrast, the mega oil-tanker serves as the perfect representation of the cultural, geographic and economic history of these oil-rich nations. By changing the function of the discarded mega oil tanker in a sustainable and functional way, the anchored mega ship can be kept as a true icon of the Arabic States in Southern Gulf region into the present and next era. 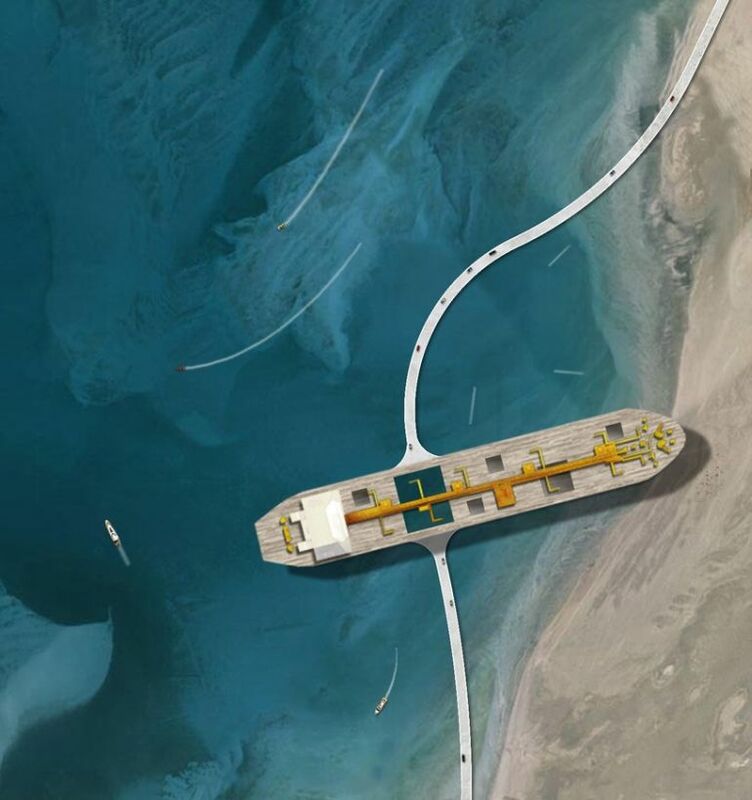 In the Black Gold project, the architects propose the transformation of an abandoned mega tanker into an iconic, culturally-appropriate architectural marvel. 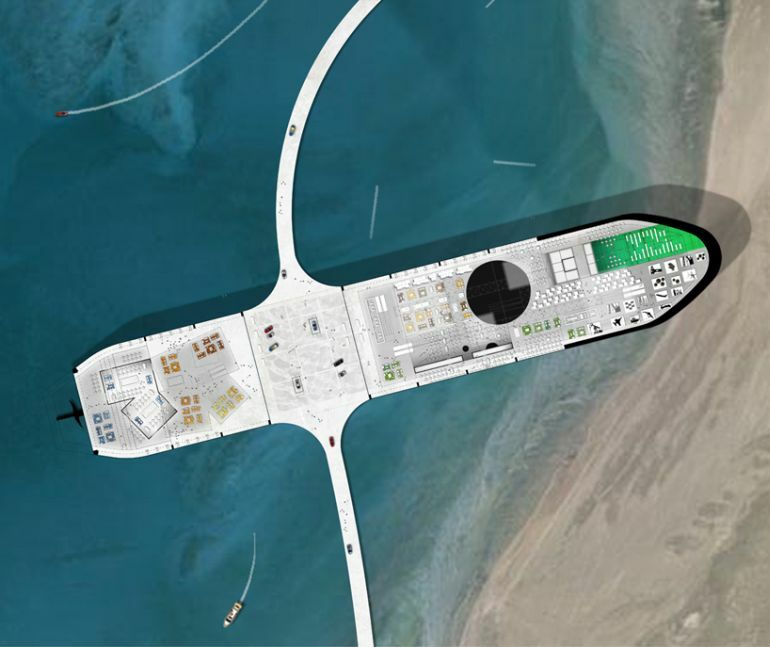 The project re-imagines the anchored ship as an incredibly modern mixed-use structure, with dynamic functions. The vessel’s interior can house a museum, a cultural exhibition area and a shopping center, while the expansive floor surface can be used for conducting a variety of events. The huge inside height allows multiple floors or volumes to be stacked one on top of the other, making it ideal for short or long stay. The deck features a spectacular glass-bottom swimming pool, in addition to pedestrian walkways that provide breathtaking views of the surrounding landscape. According to Collaris, the twin steel walls act as climate buffers, thereby insulating the ship’s interior from the scorching heat of the Southern Gulf region. The building can be accessed by means of a road lining the hull, on both sides.